Successful leaders have always relied on some form of data to help them make decisions. Data collection used to be done manually and it was quite financial & time & HR demanding activity. For this reason, many companies used to operate with limited data collection, even they were ever that data can help them understand their customers better, meet better decisions or solve difficult problems. Nowadays, gathering data is much easier because many useful and very user-friendly tools were developed. Most of the companies, organizations or institutions are collecting data and working actively with them in order to enhance their operations to ensure the overall growth. Why is data important for your clinic? Want to know what data top clinics collect around the world to improve their reputation, reviews and revenue over time? 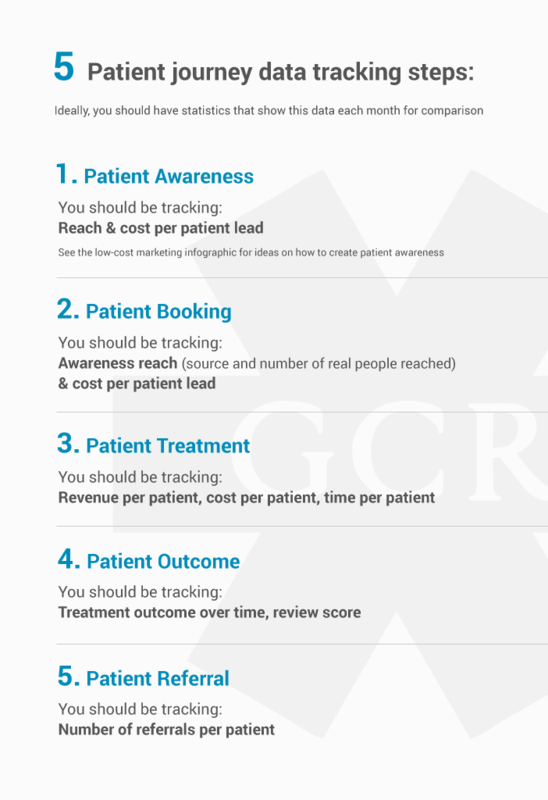 Here’s a handy chart that we have put together with exactly what should be tracked at each stage of the patient journey. This can be done in a simple spreadsheet or other software by your admin team and will give you a real overview of what’s working and what isn’t – and most importantly – what to improve. I hope that helps!